Arclight is a very unusual line of skins, showing the dark LoL champions on the other side of the confrontation – as fighters of light, Arclight. And I must say that this was a splendid idea. Not so long ago, Riot Games released an unexpected skin, our old friend joined the trinity of Arclight, the champion that did not receive any new skins since the very release – Yorick. Arclight Yorick fits perfectly into the overall concept, but we’ll discuss this skin more in detail a bit later. Since Arclight series of skins is very old, it is not worth to wait for a lore or backstory from it. In those days, developers created only a common theme, not developing the concept of skins any further than just skins. It is possible that in the future they will touch upon this topic (for an example, Blood Moon has a great lore behind the skins, as Projects), but for now let’s just skip the Origins, and leap straight to the Arclight skins review. It is too sad that developers skip such glorious theme and did not release any ward skins, or summoner icons. But from the other side, developers spend all their time on skins development, and in the end, we received the most attractive LoL skin series. Before we continue, I want to mention that this post was written thanks to the Boosteria – LoL elo boosting service. 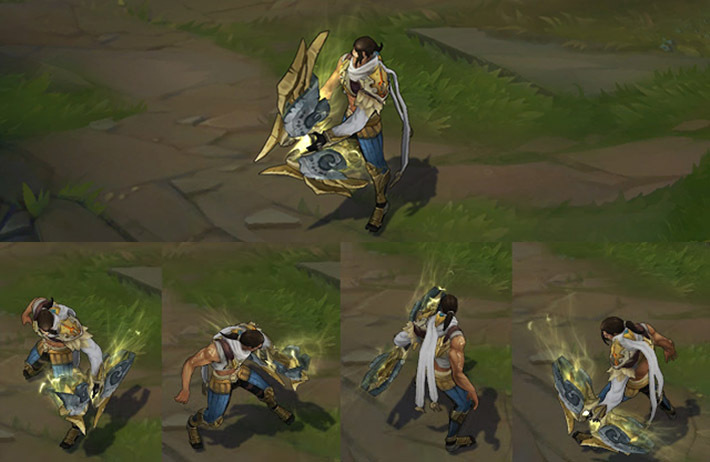 Arclight Varus – this skin shows us how this great keeper was before his corruption. A Very rich concept, allowing to open the champion completely from the other side. The appearance of the marksman has undergone drastic changes and now the champion simply oozes with light, just look at his eyes or on a barely noticeable tattoo on his right hand. The new suit looks great, much better than the bare torso, and the lighter overall color scheme of the champion is good for the tired eyes. The bow has also changed very much – now it just glows from within with its light energy, overflowing with it, echoing with the warmth of light, eternal calmness and purity. Although Arclight Varus is an old skin, it still got both visual and sound enhancements. New particle effects now leave a beautiful light trace, and along the entire path of the arrow appear energetic angel wings. Especially I love how developers present the new ultimate – Chain of Corruption. Despite the newly acquired sanctity of the champion, the developers have not forgotten about the ability’s name – Chain of Corruption, which just can not have the pure light nature. Developers have found a way – now Chain of Corruption has a dual-nature and it looks perfect. A light-dark projectile rushes toward the enemy and creates a whirlwind of dark and light energies. If there is another champion next to you, then a light chain will rush to him. Sound effects are not bad, but still, they do not reflect that holiness that tries to show us the skin and splash art. But still, this is the usual sound of an arrow falling into a target. But the changed intonation of the voice acting well affects the overall appearance of Arclight Varus. Long story short – for only 975 RP you will get one of the best Varus skins, which changing visual and sound effects. 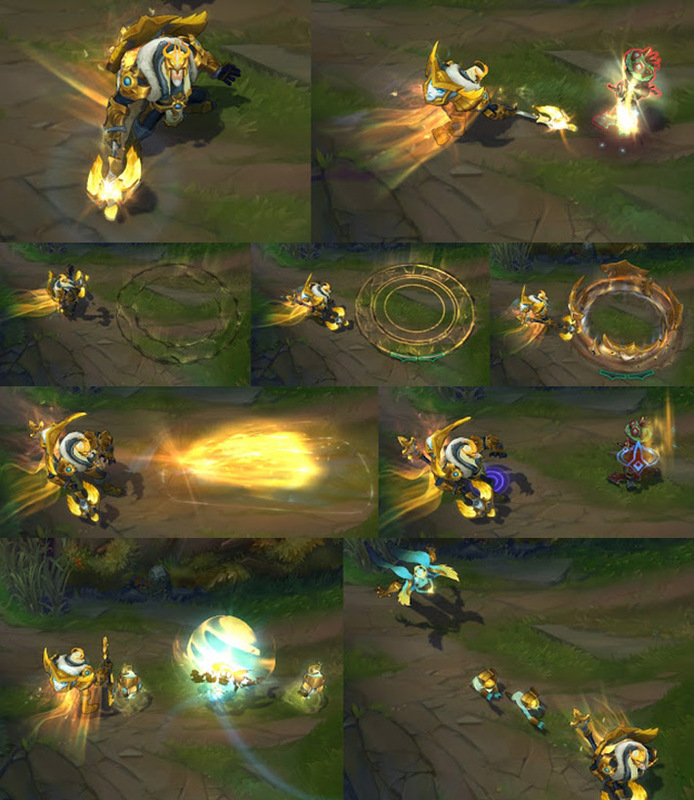 Arclight Varus must-have skin and it must be in everyone’s collection, especially if you love the overall light theme. 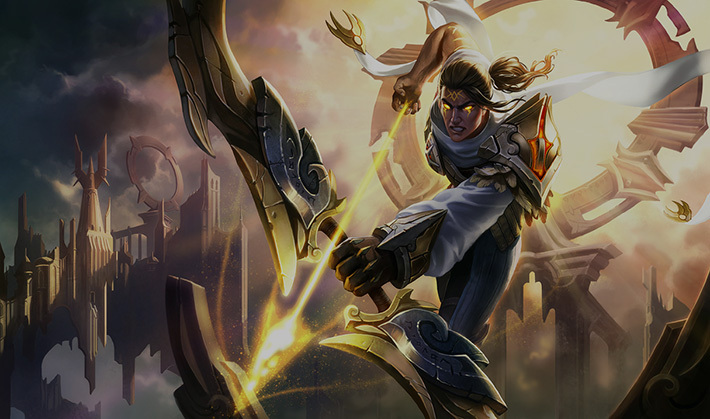 You can buy Arclight Varus skin for 975 RP in the LoL in-game store. In my opinion, Vayne was not a dark champion, she was always a night huntress that exterminating darkness. Now she from a night hunter turned into a holy warrior, shining from the within with the brightest light. 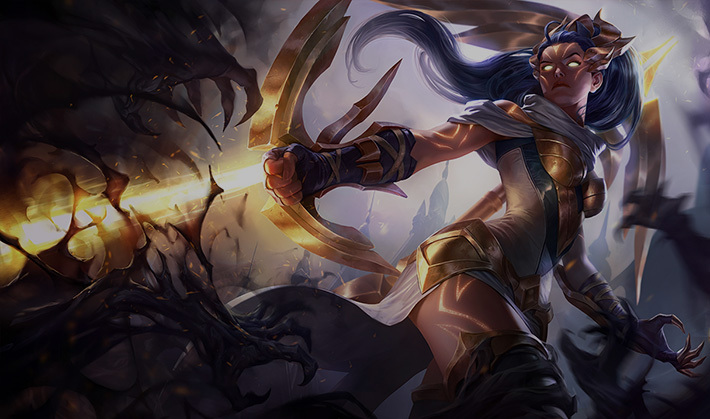 The very concept of the Arclight Vayne is very interesting, and splash art is outstanding and causes a burning desire to buy this skin as quickly as possible, but still, the in-game implementation brings disappointment it does not catch up with the splash art in its epicness. 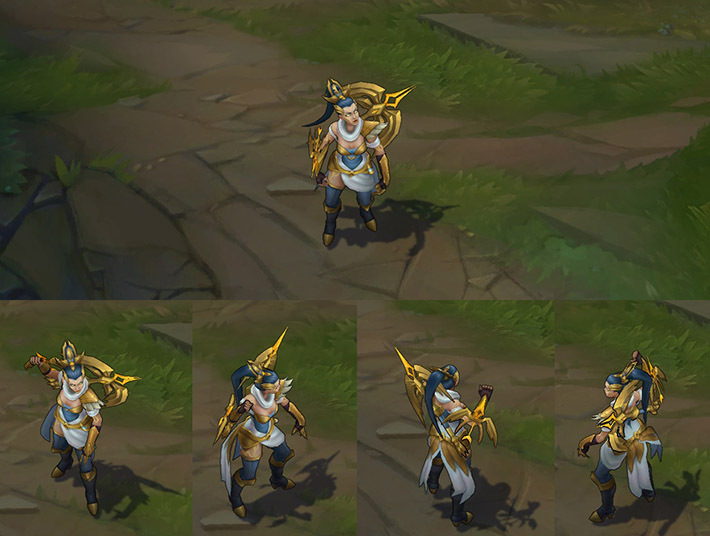 The general color scheme is white-gold – Arclight Vayne is dressed in an ordinary white tunic, decorated with gold, and on her head, she has a beautiful diadem. Like Varus, bright tattoos appeared on her body and her eyes glowed from inside with pure light. The crossbow looks quite ordinary and, frankly speaking, unpleasant. Ordinary, but gold weapon – this is not what you expect to see in the hands of the holy warrior, especially taking into the account that this crossbow is her ultimate ability. What about the new visual effects? Here I have a dual opinion. On the one hand, we got quite good visual effects, made in the form of golden angelic feathers and a light energy trace, but on the other hand – we already saw it all at Arclight Varus. Yes, I understand that they are both crossbowers, the abilities are somewhat similar, but I do not believe that the developers have lost their imagination. Take for example the Arcade skins, united by one theme, but each champion had unique visual effects. Perhaps they were not all ideal, but most importantly they were unique. So why reuse existing ideas for Arclight Vayne? I am afraid that we will never get an answer to this question… New animation of the recall is not even worthy to mention. Arclight Vayne just soars into the sky, and after a while appears on the base. In the sound effects, I see all the same issues that Varus have. They just do not fit the concept of skins and do not let you hear that unsurpassed purity of light that is in the Arclight Champions. The only ability, though somehow reminding us of the divine origin, is the Final Hour. Skin released 2 years after Arclight Varus completely repeats his strong (visual effects) and weak (sound part) sides. I’m especially saddened by the fact that the developers just decided to copy the particle effects from their past skin of this series and did not come up with anything new. Personally, I do not like this Arclight Vayne skin and I do not recommend it to buy. 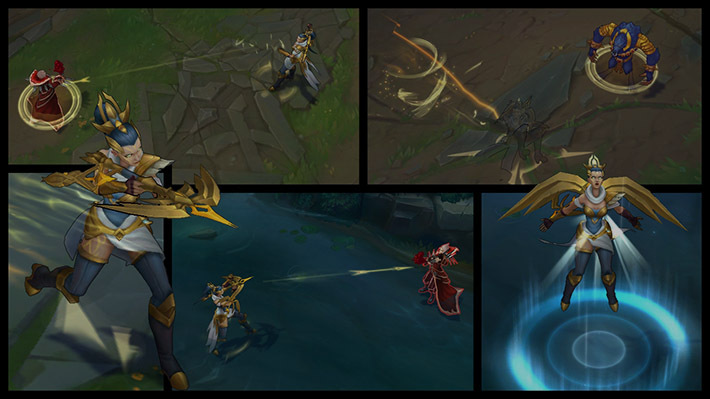 You can buy Arclight Vayne skin for 975 RP in the LoL in-game store. Arclight Vel’koz gives a wonderful first impression to the players. Shining with pure light, Vel’koz dramatically changes our vision of this character. Previously, he represented the embodiment of a pure abyss, but now the light has taken hold of his heart. The new armor in the gray gold decorations, tentacles of light and celestial eyes look very beautiful. 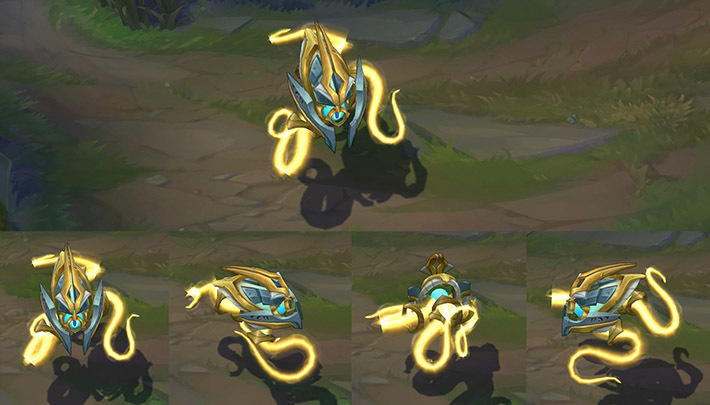 Color scheme, I think, was borrowed from StarCraft, namely the protoss, because the appearance of the Arclight Vel’Koz is very similar to the representative of the ancient race of that universe. New particle effects are remembered but still not surprising, basically it’s all the same classic abilities, but now taking the energy of light for a source of power. 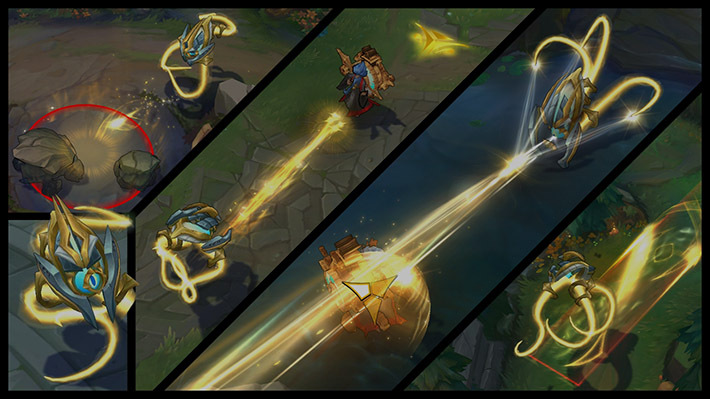 Because of all this light, the abilities of Arclight Vel’koz do not look threatening anymore. As an excellent example, I want to notice the Life Form Disintegration Ray – Vel’Koz simply shines a directional beam of light, which does not correspond to the name of the ability. The new recall animation is interesting, and showing us that the true Vel’Koz is only the Eye itself. During Recall, Arclight Vel’Koz leaves his flexible exoskeleton and just flew to the base, where another costume is already prepared for him. The sound effects finally coincide with the general spirit of Arclight Skins. High ringing sounds accompany every Vel’Koz ability. The new voice of the Vel’Koz is just right, like the champion, empowered by light must have. Arclight Vel’Koz is a fantastic skin that is very close to perfection, just like Battlecast Vel’Koz. Yes, it has a couple of flaws, but otherwise, everything is perfect. I strongly recommend it to everyone. 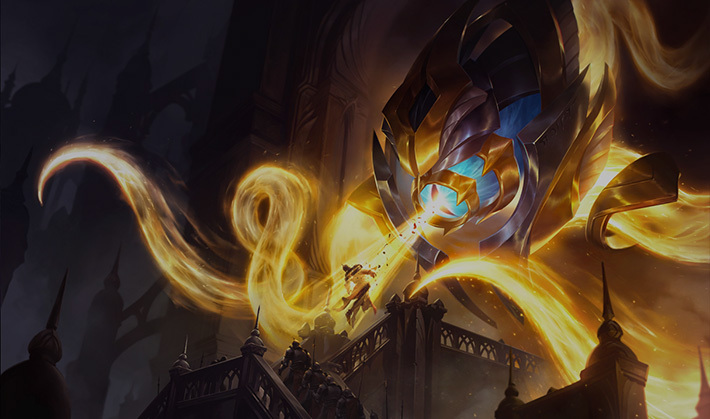 You can buy Arclight Vel’Koz skin for 1350 RP in the LoL in-game store. 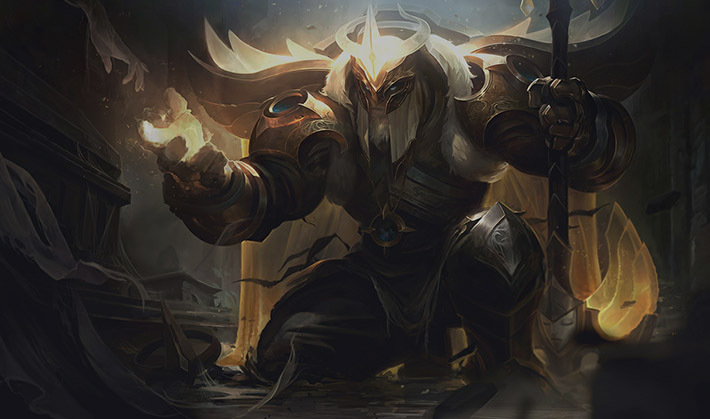 I would never have thought that Yorick, the shepherd of lost souls can look so majestic and inspiring. The sharp transition from the gravedigger to the paladin even shock and radically changes the feelings when playing for this champion. But in fact, only the source of Yorick’s power changed – where there was darkness, there is light now. 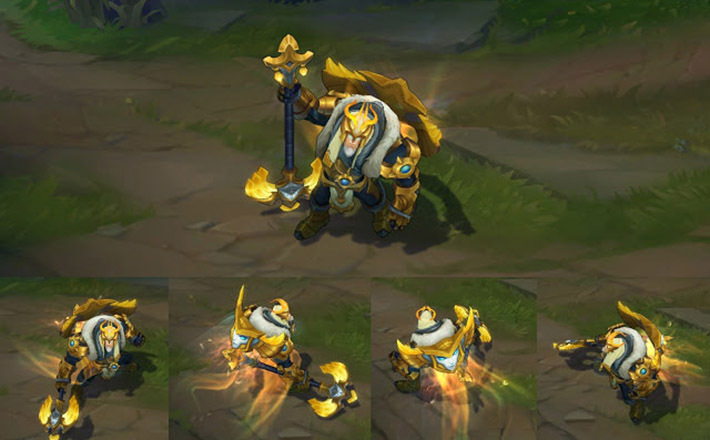 Arclight Yorick is clad in gold armor, armed with a golden ax (crozius) which glows from an overabundance of pure light energy. You can also notice a huge shield hanging behind the back of the Arclight Yorick from which comes an endless stream of light, it displays the maiden of mists(of light in this case). The chic white fur collar excellently distinguishes the new golden crown of Yorick, who rises in all his newfound grandeur over his enemies. The design of the maiden cardinally differs from its original. Now, this is the disembodied spirit of a woman wearing a golden diadem. Huge golden hands are a direct tribute to the classic design because she does not use these claws to attack. Mist Walkers are also now ghostly and clad in gold armor to match the general theme of the Arclight skin. New Particle Effects are made in the form of a variety of flashes of light (thank God that no angel feathers). All abilities also changed their source of power to the light. Dark Procession calls around the target shields, which almost completely repeat the design of Arclight Yorick’s shield. The new recall animation is gorgeous – Arclight Yorick sticks his crozius in the ground in front of him and, with the help of the crown, summons the Maiden of the Mists, who raises the paladin to the sky. The sound effects are interesting and have high ringing sounds at their core, but unfortunately, there is no feeling of the crozius’ severity and the strength of the blow in the attacks of Arclight Yorick. But nevertheless in new sound effects, there is a pleasant surprise – this is piano music during the action of Eulogy of the Isles. Arclight Yorick is an excellent skin that fulfills its value by one hundred percent, and I’m sure that all Yorick players already have this skin in the collection. A little advice to those who have not bought this skin yet and like to play for this champion, but are tired of all its gloominess, then I strongly recommend you to take a closer look at Arclight Yorick. You can buy Arclight Yorick skin for 1350 RP in the LoL in-game store. Varus also is decent though but still there are much much better options.